Extell Development Company, a premier luxury real estate development firm with a portfolio exceeding 20 million square feet, and SMI USA (SMI), the US subsidiary of Shanghai Municipal Investment, a leading infrastructural investment company responsible for the esteemed Shanghai Tower, announced today a joint venture agreement to co-develop Central Park Tower, a $3.0 billion supertall residential and commercial project located on Billionaire's Row in midtown Manhattan. "This strategic alliance with SMI brings together two international industry leaders with a track record of creating iconic global skyscrapers. SMI has developed the tallest building in Shanghai and we look forward to our partnership as we jointly develop the tallest building in New York City," said Gary Barnett, founder and CEO of Extell Development Company. 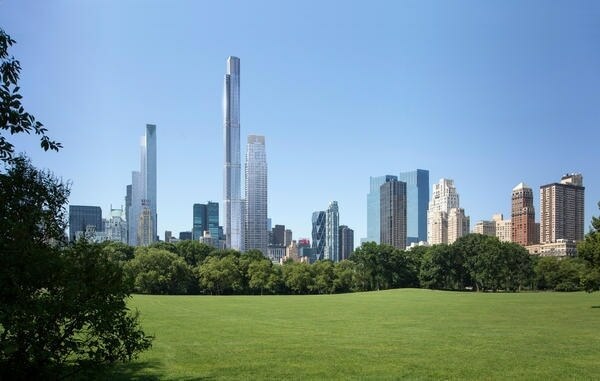 "We believe the superb location, views, design and quality of Central Park Tower will make it the most important residential building ever to be built in New York City and expect it to be a great success for Extell and SMI." SMI's investment will have first priority, and its investment is expected to receive a return of 20% to 30% per annum over the course of the project. "We are excited to be able to participate in the development of the tallest residential tower in New York City, on a conservative high return basis. We look forward to a long lasting relationship with Extell, one of the top development companies in the United States," said Tom Tao, President of SMI USA. Rising to 1,550 feet high, Central Park Tower, when completed will be the tallest residential building in the Western Hemisphere and offer unprecedented 360-degree views of New York City and beyond. Adrian Smith + Gordon Gill Architecture, the renowned architects whose credits include the world's tallest building, the Burj Khalifa in Dubai, and Kingdom Tower in Saudi Arabia, the future world's tallest building, have now designed Central Park Tower which will be New York's most significant contribution to the global stage of supertall towers. The architectural vision for the project is founded on the principles of integrated architectural design, interior layouts and structural efficiency, positioning the building as a powerful statement in the Manhattan skyline. Located at 225 West 57th Street, Central Park Tower is slated for completion in 2019 with sales launching later this year. Central Park Tower will also be home to Nordstrom's first full-line New York location. Nordstrom Inc., the prestigious Seattle-based fashion specialty retailer has signed an agreement with Extell to locate its long-awaited flagship store in New York City. This would be the retailer's second largest store, and is set to open in 2019. Extell's expansive portfolio of properties, including the internationally-recognized, record-setting luxury condominium One57, have solidified its position as one of New York City's top real estate development firms. SMI's extensive experience is highlighted by the recent completion of the second-tallest building in the world and the second to break the incredible 2,000-foot barrier, Shanghai Tower. SMI has successfully executed 80 mega projects spanning from the comprehensive reconstruction of the Bund to the Shanghai Yangtze River Tunnel.